Most of us know that blusher has the ability to accentuate our best bits and leave us with a radiant glow, or it can make us look like we’re off to join the circus! 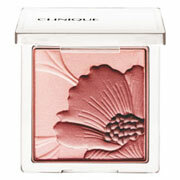 If you’ve been searching for a subtle blusher that won’t make your cheeks bright pink, Clinique’s Fresh Bloom Allover Colour could be for you. As the name suggests, this product can be worn all-over and is actually marketed as a long-wearing powder rather than a blusher, but it gives an amazing glow and will highlight cheekbones beautifully. You can even use it on your neck and chest for a natural looking all over glow but do use sparingly – only the tiniest amount is needed. Available for £23 – and look how pretty it will look in your make-up bag!